As a diver, I've been a witness to one of the most important environmental battles that's taking place on this planet. Sadly, it's a battle that most people will never see and many may never hear about. That's because the battlefront is often 20 metres under the water. As a diver, I've been a witness to one of the most important environmental battles that's taking place on this planet. Sadly, it's a battle that most people will never see and many may never hear about. That's because the battlefront is often 20 metres under the water. The two opponents: the usual suspects on one side, unrestrained development. And on the other -- the world's living coral reefs. Think I'm exaggerating about how critical this struggle is? In its report to Congress in 2012, the National Oceanic and Atmospheric Administration (NOAA), arguably the world's leading authority on Ocean health, stated: "Coral reefs and the services they provide are in decline and threaten 500 million people globally who depend upon coral reefs for daily sustenance and survival." Half a billion people who may face starvation if the coral reefs of this world continue to decline at their current rate. What's killing off the coral? Simple. Climate change, over- fishing and land-based pollution. NOAA estimates that 75 per cent of the world's coral reefs are currently threatened and that we face massive extinction of these valuable environmental niches within the next 100 years. Happily, not everyone is accepting the inevitability of this slow march towards extinction. There are some groups in a few isolated spots around the world that are fighting back. Roatan is one of those spots. For some who might have just done a double take at the name Roatan, some background. It's a small island off the east coast of Honduras in the Caribbean. Roatan sits right in the middle of what's often described as the world's second largest barrier reef system (the largest is in Australia). I've visited this island four times in the last five years. I've watched the slow decline of the reefs as the island has gained in popularity as a tourist destination. So you can imagine my surprise when I realized on the most recent trip that the reef was actually looking healthier -- more abundant fish life and a positive resurgence of the soft corals. Initially, I thought I might have just hit one healthy stretch of reef. But on dive after dive I noticed the same trend. So that started me asking questions about how this was possible. Turns out that several years ago Roatan decided that its reef was one of the most important resources it possessed. So local islanders took some significant steps to protect them. Romeo Silvestri, President of the Tourism Bureau of Roatan, told me tourism on the island generates nearly 8 per cent of the GNP for Honduras. Since much of that tourism is related to scuba diving, the islanders realized they had better get busy protecting their sole means of income. They'd already created a Marine Reserve on one small stretch of the coast in 1988. They expanded that reserve to the whole island in 1997. But according to Nic Bach, Roatan's Director of Marine Management, it was a "paper park." They had some good laws in theory -- no fishing zones, rules on how boats had to treat their waste, guidelines that barred snorkelers and divers from touching the reef. They even made it illegal to cut down mangrove trees (mangrove swamps act as nurseries for the reefs). But no one was making sure the rules were enforced. So a lot of poaching was going on and many of the rules were being ignored. All that changed in 2005 when the Roatan Marine Park (RMP) was founded. That group raised some money from local dive shops and business people, bought some boats, hired staff and started to enforce the rules. RMP set up buoys around the island so that no one could drop anchors or tie up to the coral. Local dive shops -- Mayan Divers, Subway Divers, Black Pearl Divers and others -- began to voluntarily keep an eye on the reef, watching for poachers and anyone else who was mistreating the coral. Licenses were given to a few to cull invasive species (e.g. : Lion Fish) from the reef that were decimating the indigenous fish populations. 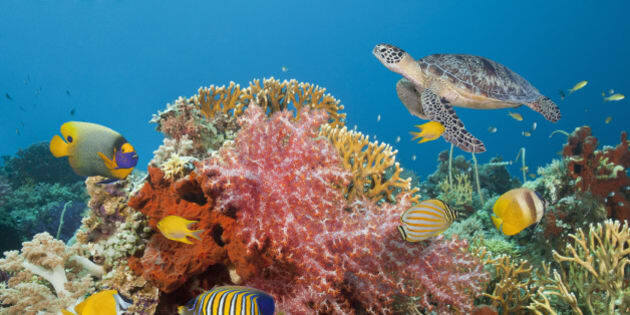 By 2014, other than a few designated development zones, the entire reef has been brought under some kind of stewardship. According to Bach, "The Healthy Reefs Initiative has been monitoring sites throughout the Meso American region." And its findings are significant: "The Sandy Bay West End Marine Reserve is one of the few places on the report card that has actually improved." The results have to be seen to be believed. I dived the reefs for a week and saw an abundance of life that I've not seen on coral reefs for many years: sea turtles (they feed on soft coral) were so common that they became matter-of-fact occurrences. I saw a species of lobster (Sculptured Slipper Lobster) that I'd never encountered before. Schools of reef fish were positively swarming around the coral. More importantly, large pelagic predators (barracuda, tuna) were starting to show up again. When the big fish come back, it means the reef system is healthy enough to support a large food pyramid. The coral itself had returned to its colorful kaleidoscopic self. Rather than seeing bits and pieces of broken and bleached coral scattered across the bottom, the reef was alive with every manner of soft and hard coral conceivable -- brain, sea plumes, even rare black coral -- the whole spectrum. Now, one battle does not a war win. I understand that. I also understand that Roatan continues to struggle to save its reef against a massive influx of tourists and people from the mainland coming to the island looking for work. But as I look around at what's going on across many fronts in what sometimes seems to be an all-out assault on the environment, I take a little solace in a step in the right direction. I'm comforted that there's still one place where I can go as a diver and experience a coral reef returning to life in its original form: fragile and beautiful and full of wonder.